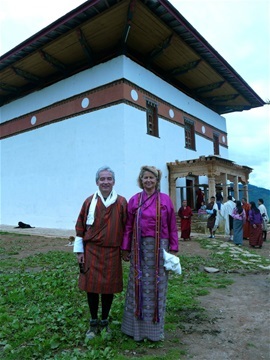 Tho has been appointed GNH program coordinator here in Bhutan and in our already very rich and complex life we are trying to find a new harmony and balance. 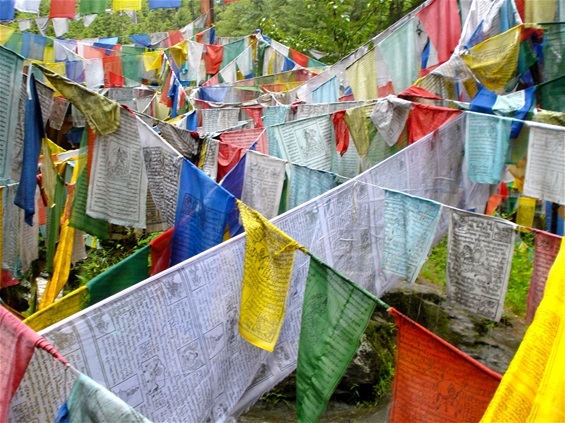 The pilgrimage/hike yesterday was great...a bit "much" for me, on my only second day in Bhutan...it went up to 3050M! It was a very nice walk but rather steep, and as we walked as a Sangha, I had to stay in the flow of the group...and at some moments I felt the altitude and effort! We were welcomed up at the monastery by lamas in red robes with trompets and cymbals....just like in Tintin in Tibet,(my two grandson's Ilya and Alexis know this story well! )....and yes the Yeti has been seen in Bhutan! Luckily , on our pilgrimage yesterday, I put on my Kira (traditional dress) only once up there...I would have fainted otherwise...the belt is tied sooo tight!!!! I avoided all prostrations during the ceremony....At 3050m, still adjusting to the altitude, with a very tight belt it would have been dangerous! I am not sure I think Kira is comfortable...but may be one has to get used to it. It is actually just a big handwoven cloth tied around the waist held by a big belt with a rather "stiff" west. Tho needs help from his colleagues to put on the GO...it is also very complex, but I agree it does fit him ! Everyone says he looks like the bhutanese foreign minister or they just say he looks stunningly (handsome) bhutanese! My first impression is that people here seem very elegant and "at ease". One can see that Bhutan NEVER has been colonized and that it is a kingdom, so there is a natural "pride"(in the good sens) to be bhutanese. Today we take it easy as tomorow Tho starts his work again and on friday we all go fo a few days to Bumthang to visit the site of th GNH center and "our" future home there. Today is a big holliday . Buddha's first sermon. We should have gone to a ceremony, but I needed to sleep longer. I feel I need some rest, I am still adjusting to the height, all the new impressions and the jetlag. Also my time before leaving was quite stressful...and, there is a lot to take in for me! Go 's and Kira's can be VERY expensive! Really nice Kira's can be up to 1000$! Mine costs about 200$ with west and blouse and all(you can find cheaper one's) I had a west made which is not ready yet so I borrowed one from Tandin's mum yesterday. Tho's Go cost only about 30$ so this price is quite ok.
Any of you who come for a visit I suggest you to buy a GO or Kira once you are here as being with Tho you certainly will be invited to some official event! And of course his openess to the very intricate bhutanese..spiritual/buddhist mindset, is very appreciated. I wonder how our home will be in Bhumthang? I guess more rustic? So nice to read, thank you Lisi!